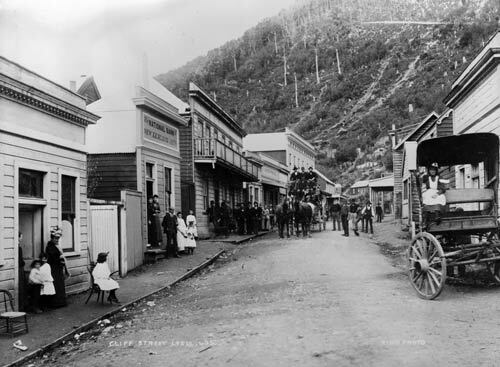 Lyell was a thriving gold-mining town in the 1880s and 1890s, and a major stopping point on the winding road through the upper Buller Gorge. This view along the main road shows a coach about to depart. Most of the trees have been removed from the surrounding hills. The town was abandoned by the middle of the 20th century, and nowadays it is the site of a Department of Conservation camping ground. The forest has regenerated.